5 kilowatt (5kW) solar systems have become one of the most popular sizes in Australia, thanks to the combination of high energy yields and great value-for-money that they deliver. What are the price ranges, electricity yields and financial returns that a household can expect from a 5kW solar PV system? This article takes a look. How many panels & how much roof space for a 5kW solar system? A modern-day 5kW solar system will be comprised of between about 15-20 panels and will require about 25-35 m2 of roof space, depending on the wattage of the panels and how they’re tilted. You can explore your own roof’s solar potential here. Australia is home to some of the lowest solar PV system prices in the world, thanks to a broad combination of global and local factors. According to Solar Choice’s own data, the average 5kW solar system price in Australia as of February 2019 is about $1.11 per watt – or about $5,530, with a low of well under $1/W ($2,750) and a high of about $1.40/W ($7,000). 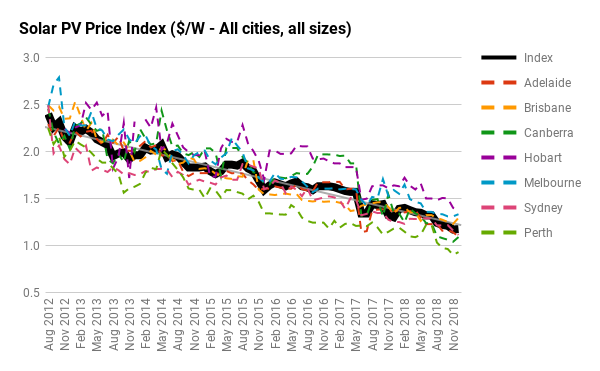 The table below, from February 2019, provides a snapshot of price trends for 5kW solar systems in capital cities around the country. 5kW solar PV system prices from across the country from August 2012 to February 2019. As mentioned in the first point above, different areas receive different amounts of sunlight. The amount of sunshine falling on a solar panel array has a direct impact on the system’s output. As a rough figure, a rooftop in Australia can expect to receive around an annual average of 4.5 hours of ‘peak sun’ (peak sun hours, or PSH) per day, although this number may range as high as 5.8 PSH per day in places like Darwin or as low as 4.2 PSH per day in Tasmania. This is only the annual average per day, and it is important to keep in mind that there will be more sun in the summer and less in the winter months. The financial returns from a 5kW solar installation are a bit harder to work out, and mainly contingent on whether or not a solar feed-in tariff is available to the owner/operator of the system. Solar Feed-in Tariff schemes pay solar system owners a set amount for each unit of solar power that they do not use themselves and instead export to the electricity grid. Returns depend not only on the output of the system, but also how it is utilised by those whose home or business it is attached to in light of the presence or absence of feed-in incentives. There are basically 3 scenarios that owners of grid-connected systems might find themselves in with regard to this. You have access to a generous solar feed-in tariff, which incentivises solar system users to export power to the grid at rates that vary from state to state, but which are usually above the retail electricity rate. If your feed-in tariff rate is higher than the rate you pay for your electricity from the grid, exporting as much of your solar energy as possible will net you the greatest returns. You have access to a 1-for-1 ‘Solar Buyback’ scheme in which you are paid an amount equivalent to your retail electricity rate for every unit of solar power that you feed into the grid. People in this category should simply try to reduce their power consumption as much as possible, as they can neither gain nor lose by either exporting or self-consuming their solar power. No generous solar feed-in incentive scheme exists. In this situation you should do your best to avoid exporting your precious solar power to the grid, and instead time your electricity usage to ensure that you are ‘self-consuming’ your solar power–i.e. use more electricity when the sun is shining, and less when it is not. Read more: How to get the most out of your solar system. Using Solar Choice’s Solar PV System Return on Investment Calculator, we’ve calculated payback periods, annual internal rates of return (IRR) and annual savings (in year 1) using 5kW solar systems for common usage situations in some major cities based on average system prices as of February 2019. Please keep in mind that the figures in the table are indicative only and will vary depending on system installation price and your individual circumstances. Also note that payback times depend heavily on the amount of solar energy that you consume directly vs export to the grid (‘solar self-consumption ratio’), so we’ve included both ‘low’ (30%) and ‘high’ (50%) scenarios. If you do not or cannot use much electricity during daylight hours, you’re more likely to be on the ‘low’ end of the self-consumption spectrum, while if you do use a lot of energy during the day (e.g. because you’re home or because you can run devices like dishwashers while you’re away) then you may be on the ‘high’ end. I want to install 5 KW solar Power Plant in Allahabad U.P for irrigation. Please contact me on my mobile no. 9838926254. Sorry, but our services are only available in Australia. Best of luck! I’m interested to buy a 5KW system with no installation. We only supply quotes for fully installed systems and don’t keep any products or parts ourselves. If you’re after just the components, some wholesalers sell complete kits (panels, inverter, cabling, mounting). Have a Google around to see what you can find. Phono solar panels are any good. I live in Sunshine coast and just wanted to know how effective these are, or can you recommend another brand. We haven’t come across BNB inverters much, but CSun and Phono solar panels are fairly well-known and commonly used here in Australia. Happy to assist you further if you want to give us a call (1300 78 72 73) or you can get an instant set of quotes from installers in our network by filling out the Solar Quote Comparison Request form to the right of this page. Could you please tell me what the Government Rebate is for 5kW (20 panels) in the Southwest of Western Australia. Postcode is 6258 (Zone 4) I believe. Thanks for the comment. According to the Clean Energy Regulator’s STC calculator, a 5kW system in postcode 6258 would create 88 certificates. The price of certificates fluctuates – at the time of writing, Green-Bank Environmental puts them at $38 each, which would put your total discount at about $3,344. Keep in mind that it may be slightly more or slightly less, however, depending on the going rate. You’ll want to check that what you’re being offered is in this ballpark. Best of luck with your system. I’m not sure I completely follow what you’re saying – or if I do, the numbers are definitely out of whack. You’re saying that your inverter showed an instantaneous output of 47kW? That sounds impossible unless your inverter is broken. Do you perhaps mean 47W (watts? ), which would be a very very low amount? But after thinking about it, I’m gathering that you mean 4.7kW, which would be a pretty good number – this is what I think you mean. 2.1kW on the overcast day might make sense as well – it wouldn’t be surprising if the cloud cover had reduced your system’s output by about half. OK! Soz mate! It displayed on the inverter 21 kWh today??? 35 digrees here! Is that any good! Yep – if your 5kW system produced about 21kWh over the course of the day, that’s on slightly on the low side but still in the ball park for most of Australia (Sydney, Brisbane, Adelaide, Perth, Melbourne). If you’re in Darwin or far north Queensland, it could be better. If you’re in Hobart, it’s pretty good. But assuming you’re in Sydney, the heat could be the reason that your production is slightly on the low side – solar panels do better in cooler weather, and become less efficient as the temperature rises. So in short, it sounds like things are probably fine with your system. Just in case, however, we’d recommend getting a second opinion – maybe you could ask the company that installed your panels in the first place? What will be the total output in a day and for an hour??? Normally we would ask for your location, but instead you’ve provided us with the number of peak sun hours available in your area. The CUF isn’t really relevant to the calculations because this is already indirectly incorporated in the number of peak sun hours. In that case, the calculations are relatively easy: 5kWp x 8PSH = 40kWh per day – as long as your system is north facing (or south facing if you’re in the northern hemisphere). It’s best to assume only 80% efficiency just to be conservative: 40kWh x 80% = 32kWh. Hope this helps. Please keep in mind that these are back-of-envelope calculations only and should not replace the advice of an accredited installer who knows about all of your individual circumstances. We live at Robina on the Gold Coast and have just received our first full power bill after having 5Kw solar system installed with a 6 cent feed in tarriff. Our previous bill (which had the solar included for only 30 days) showed a significant reduction of 30 percent to our overall bill and a feed in credit of $36. So we were anticipating a significant reduction in our first full summer quarter but were extremely disappointed. Our bill says our average daily use is 4 Kwh MORE and average cost per day is exactly the same as the previous year! We are producing the maximum power allowable and our power usage has increased by 10 percent. How can that be? Sorry to hear you’re having problems. Are you sure that there isn’t currently an issue with the system? It sounds highly unlikely that you would have excellent performance one quarter followed by no benefit the next. Either you’re using a lot more electricity this month (so much more that the solar isn’t making a difference) or there’s a problem with your system. Please also note that you should endeavour to use as much electricity during the day as possible to maximize the amount of money your solar panels can save you. You can read more about this here. Hi, I have a 5kw system. I live in a Rockhampton, Qld. (it’s hot!) My panels produce on average 15-16kwh /day. My sister, who lives across the road from me and has the exact same system install produces 41kwh/day. I’m not sure why? Can you offer any suggestions. Those figures don’t sound right at all–is 41kWh/day from your sister’s system a summer figure? I assume they’re both 5kW systems. Are there any trees or other objects that could be casting shadows across your panels during the day? More questions: Have you contacted your installer? Do you have a monitoring system set up? Depending on the answers to these questions, you can begin to get to the bottom of this situation. Thanks for your reply. Yes, the 41kwh is a summer figure (both figures gathered on the same day, both exactly the same 5kw system, no trees or shade covering either system). My sister is about $1000 in credit with Ergon Energy, whilst we’re lucky to get $350 off our $850 bill) no monitoring system set up. I think I will contact the installer to come out and check everything. Yes–that’s probably the best move. By the sound of it, something might be wrong with one of your strings of panels. It could even be that you have just one defective panel knocking out the rest in that string, but you’re best to speak to an expert about how to remedy that. I am interested in the 5KW or 10KW, is it enough for the family of 4 people and what about supply and installation cost? Whether a 5kW or 10kW system is sufficient for such a household would depend on your daytime electricity usage. In today’s Australian solar scene, with feed-in tariffs at low rates, it’s critical that a solar home or business consume as much of its power during the daytime as possible–so an oversized system would be counterproductive. Any of the installers in our network (or our own staff) can help you out with determining a system size. Request a Solar Quote Comparison go start up a dialogue with us. In Vic. Prices on 5 kw system, please. You can get a free, instant comparison of about 7 solar PV system installation price quotes for your area of Victoria by filling out the form to the right of this page and then checking your email inbox. We hope to hear from you soon.